Shane O’Neill, the great Ulster lord of the mid-sixteenth century, merits a biography. Brady’s is accessible, exceptionally well-written and strong on high politics and Anglo-Irish relations. Shane’s visit to the court of Elizabeth is no longer a barbarous freak-show but the subject of court intrigue. There is the state’s botched attempt to poison O’Neill by having a Dublin pharmacist spike his drink. The subsequent peace of Drumcree (1563) collapses when no parliament is called to ratify it. Equally compelling are the accounts of O’Neill’s defeat at Farsetmore by the O’Donnells and the ensuing fateful negotiations with the MacDonnells. However such pacey narrative requires close reading. The author’s apparent sympathy for his subject is betrayed at times—for instance the Geraldine faction amongst whom Shane was a leading player is described as ‘malign’ without any similar condemnatory description of the opposing Butler alliance. Where Shane makes overtures to foreign states when threatened by English power the sentence begins, ‘More sinisterly…’. Furthermore an analogy is made between Shane O’Neill and Tyrone and Hitler and Germany. Not only is the lordship politically unstable and internally divided, it is also hemmed in by enemies and is ‘too big’. 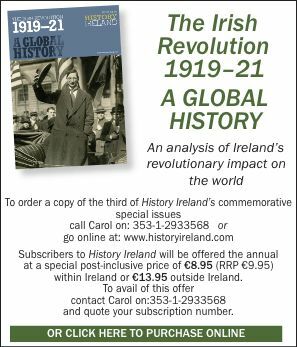 Subsequent chapters are entitled ‘The resistible rise of Shane O’Neill’, ‘The lost peace’ and ‘Appeasement and drift’. Shane could be a nasty piece of work but did he really kill 4,500 inhabitants of Tirconnell during an invasion in summer 1564. This is stated as fact without any hint of qualification even though the only source, which in fact says the alleged deaths took place over a three-year period, is the uncorroborated and here unfootnoted account of his Tirconnellian enemy, Calvach O’Donnell (State Papers 63,11 no.96). A major bone of contention and cause of contemporary conflict was Shane O’Neill’s claim to succeed Conn Bacach O’Neill as eldest legitimate son. When the surrender and regrant arrangements were being made with the crown in 1542, ‘the legitimacy’ of Felim Caoch and at least four other elder brothers ‘was in no doubt’. None of Brady’s footnotes substantiate this claim whereas the earliest O’Neill genealogy (SP 63/56, nos. 63, 64) has Felim down as ‘a base son’. Nor are there any questions raised about The Annals of the Four Masters’ information that Felim Caoch and two other sons of Conn died in the key year of 1542. Perhaps there was an internal coup against Conn which forced his rapprochement with Dublin and which Shane, a legitimate son then in his early teens, was lucky to escape. We should have been told more about Feardorcha, designated by Conn and the crown as Baron of Dungannon and successor under surrender and regrant which was designed in theory to encourage primogeniture (succession of eldest legitimate son). Brady states that he was ‘one of the principal powers’ in Tyrone in the early forties but not that he was a crazy choice as successor. He was certainly illegitimate—Shane claimed he was not an O’Neill at all but the son of one Kelly, a Dundalk blacksmith. In 1552 Conn O’Neill himself stated in a petition to Edward VI (S P 61, 4, no.6) that ‘he did find his conscience grieved to take the said baron to be his son which was taken and named to be another man’s son during the space of XV years’. Even the baron’s name, Feardorcha, reflects his obscure origins. Since he was brought up outside Tyrone, he had no vital fosterages by the household families and his mother was of a low social status. On the other hand Shane was fostered by the O’Donnellys, not simply the ‘moderately comfortable family’ described by Brady but the main military family in Tyrone. Furthermore Shane had a noble mother, one of the Clandeboye O’Neills, and could expect support from that quarter. Feardorcha may have been the strongest in 1542 but in the long term even with support from the crown and its local agents such as Marshal Bagenal his chances of succeeding were remote if confronted by a legitimate and well-fostered challenger like Shane. Then there is the small matter of Shane’s problematic killing at the hands of the MacDonnells in 1567. When Brady first wrote about this in the Irish Sword (1982), he seemed to hint at a government conspiracy against Shane. Now he concentrates on a single document—the earliest account of the assassination—which he reproduced on that occasion and states that ‘Shane’s death was not preordained but the result of immediate calculation, expediency and chance’. But surely there is still a case to be made for the government using the MacDonnells as proxies to kill him after promising them settlement rights in Ireland. Alexander Óg MacDonnell contacted Lord Deputy Sidney before his meeting with O’Neill. In his ‘Memoir’ of 1583, Sidney claimed that Captain Piers, the local army commander, had practised to have Shane murdered by the MacDonnells ‘according to my direction’ (Ulster Journal of Archaeology (1855), p.91). And if there was no conspiracy, why was Piers allowed to collect the large reward for bringing in Shane’s head? The author in his peroration about medieval lordship of Tyrone states that the O’Neills had two options in external relations, either co-operation with the king of England or alliance with his representatives in Ireland, first the De Burgos of Ulster and later the Fitzgeralds of Kildares, but fails to mention the third approach, the anti-English one. There is no reference to Domhnall O’Neill’s remonstrance to the Pope in 1317 and his support for the Bruce invasion which surely prefigures Conn and Shane’s later overtures to the Scottish monarch. No mention is made, as noted by other scholars, of a propensity amongst the late medieval O’Neills to prefer the succession of the eldest legitimate son. Nor is there any sign of Shane’s modernisation of Tyrone’s military forces or his attempts to improve its agricultural base as adumbrated elsewhere. Nor is there any epilogue about the disastrous consequences of Shane’s posthumous attainder in 1569 which banned the O’Neill title, annexed most of Ulster to the crown and disinherited his offspring, the MacShanes. A different view of Shane O’Neill can be posited. The Tyrone lordship was no more unstable or divided than other regional powers in Ireland. The lordships of Ormond, Desmond, Thomond and Clanrickard were likewise attempting to control huge territories; it was English policymakers who thought they were ‘too big’. At the end of the Middle Ages, the O’Neills of Tyrone seemed to have attained stability by alliance with the earls of Kildare. The Kildare rebellion of 1534-5 shattered the evolving stabilisation of the whole country. When surrender and regrant offered a new constitutional arrangement in Ireland, the O’Neills of Tyrone were forced to participate. At the time Feardorcha was the strongest candidate to succeed Conn but in the long run the rise of Shane, the eldest legitimate son or the eldest surviving legitimate son, was irresistible. It was not that the English ‘abhorred the violence’ of Shane O’Neill so much as feared his capacity for such violence. Shane’s problem like that of other Irish magnates was that crown policies after the Kildare rebellion were made wholly with the interests and needs of England in mind. Henry VIII had made himself an international pariah by divorcing the Emperor’s aunt and breaking with Rome. It was England that was ‘too big’ for the British Isles, hemmed in by perceived foreign threats from Scotland and Ireland and as a result increasingly interventionist in its peripheries. This alternative view of O’Neill appears in my article ‘The end of Gaelic Ulster: a thematic interpretation of events between 1534 and 1610’ in Irish Historical Studies (1988) and in the introduction to my book, Tyrone’s Rebellion (1993). Yet there is no engagement let alone mention here. This oversight is all the more careless given the claim of the publisher, the Historical Association of Ireland—printed on the book’s back cover—that ‘the Life and Times studies report the work of established scholars and bring to a wider audience the research of younger historians…supported by critical reading lists, full scholarly references and useful comparative chronologies’. Nevertheless, Shane O’Neill is a rattling good read.